The wrinkle is that Udemy frequently discounts the course to $10, which made our discount price of $79 look like a ripoff, even though we'd packaged our version with several bonuses to increase the value. Later that day, John and I jumped on a call to do a post-mortem on the launch, and we got to talking about that tweet and Udemy's practice of offering fire-sale pricing. However John's idea got the wheels in my head turning. Let's do one more email. And we'll open with a screenshot of the nasty tweet from @DrunkOldBastard. Since this guy called John out, he'd decided to take him up on the challenge and not only *match* the Udemy price, but BEAT the Udemy price. And drop the Simple Programmer price all the way down to $9 for one day only. John is always up for crazy experiments—he loved the idea, so I wrote the email up and fired it off at 3:02 p.m. EDT. Usually I find that late afternoon is *not* a good time for sending sale-related emails. Not true in this case. The sales came pouring in—every time I refreshed the browser it seemed like we'd made another 10-20 sales. By the time the dust settled, that one email had generated an additional $6,696 in sales on top of what we'd already made from the launch. Lots of good takeaways from this little experiment. Even though we made 8X more sales at the lower price point, our revenue from the higher price was MUCH greater. So launching at the higher price was still the right call. However, nearly half of the $9 sales came from subscribers who'd never bought anything from us before. Many of them were from India, where the relative income differences make it tough for them to afford our higher prices. In the future, I'm planning to run occasional “fire sales” like this to our $0 subscribers. 90% of any list falls in this category—that's a lot of untapped revenue just waiting there if the price is right. P.S. Didn't our customers complain? A few did, and we ended up issuing a handful of refunds to people who wanted to buy at the lower price. A greater number replied to express their support. 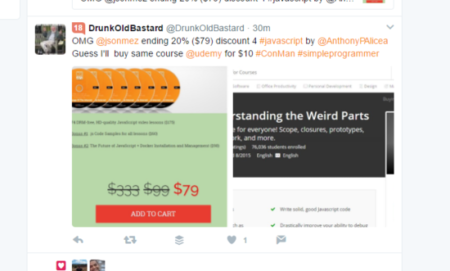 By the way, I have now bought Tonys course both from you and on Udemy. Keep up all the good work you're doing! And let me tell ya, it felt a lot like getting kicked in the gut. To understand why, I need to fill in some backstory. This all happened at the tail end of a product launch I was running for Simple Programmer. For this launch, my business partner John and I were experimenting with “white labeling,” i.e. working with another digital course author to repackage his product, add some extra bonuses, and resell it to our audience under our own brand. And the course itself was *excellent*. In fact, the course was so good that it was one of the top sellers on the Udemy online learning site—something like 75,000 people had enrolled. On the Udemy site, this course was listed at $175. Our price point for the course was $99 with a discount of $20, plus we include bonuses that are easily worth another couple hundred. However, Udemy periodically discounts their version of the course. And they cut the price way, WAAAAY down. All the way down to $10, in fact. So that's why my stomach twisted when I saw the tweet from @DrunkOldBastard. Later that day, John and I hopped on a strategy call to discuss the launch—and of course we started talking about this tweet. And it just seemed like so much fun that we both agreed we just HAD to give it a try. In fact, limited-time discounts are my go-to option when I want to crank up the pressure on waffling would-be buyers. Sometimes though you just can't use discounts. Maybe you have fixed costs to cover. Maybe what you're selling is your time, and you don't want to find yourself slaving away in the salt mines for peanuts. Whatever the reason ruling out discounts does NOT let you off the hook when it comes to generating a sense of urgency and scarcity in your buyers. Without a reason to act *now*, most buyers will choose not to choose—and you'll lose a lot of sales. 1. Limited-time bonuses. When they buy now, they'll get something extra—preferably of equal or greater value than the product they're buying. 2. Limited quantity. This works great when you can come up with a real-world constraint that makes sense. Like capping enrollment in a class at 10 students, or taking one and only one new freelancing client. 3. The “reverse discount”—announce you're RAISING your prices, but anyone who buys before the deadline will be “grandfathered in” and get the current lower price. You can “bundle” several products together and offer them at a special, limited-time package price. This is effectively a discount, since you're offering the bundle at a lower price than what the products might cost individually. But the sales you make will have a higher per-ticket value than if the customer bought just one item—and that's a win in my book. Can You Guess What This Customer Was Thinking? I know this software developer who's been trying all kinds of things to sell monthly subscriptions to a membership site. The site teaches other developers how to do complex calculations in an obscure programming language that's uniquely suited to these sorts of intense computational tasks. Not a lot of competition out there for him, so he's put a premium price on his product ($50 a month). He's been frustrated with the small number of signups though. At my urging, he ran a little experiment and offered a “buy it now” price in addition to the monthly membership option. I got 2 course sales and 2 new membership purchases. I was shocked that someone decided to buy $200 worth of courses when they could get the same content for $50 / month. There's no way it would take them 4 months to go through the courses. On the face of it, these customers' decisions do seem completely irrational. I asked him what went into his decision. I think the big thing is that he said he's conflict-adverse, and cancelling felt like a form of confrontation. This is a *priceless* insight. It makes so much sense in hindsight—yet you'd never guess that “I'm afraid this will lead to conflict” is what's running through your buyer's mind as his cursor hovers over the Buy Now button. One counterintuitive implication of this is that reducing the “friction” of the refund process in this case may actually increase sales. My friend never would have learned any of this if he hadn't ASKED the question—listened to the answer, and thought hard about what the customer was really saying. I never cease to be amazed at what you'll learn with this simple step. Do You ‘Need’ A Different Sales Funnel For Each Product? The way I run the email list for Simple Programmer is WAY more complex than most businesses need. Most people would do much better to take a simple approach. If you have two products, do you have to create two lead magnets and two email courses? Or you can create a lead magnet with one course and just go into another course when the previous course is ending? Imagine that you have a product about photo editing and another about how to use lighting for better photos… The pain point of each course is different. In this case I think that the best option is create two lead magnet (can be email courses) and two squeeze pages and sending traffic to those squeeze pages. Just because you have two different products that solve two different pain points does NOT mean you automatically need to have two different lead magnets or email courses. Just because you only have one product doesn't mean you should only have one lead magnet or email course. Sometimes you will do better with two, or even three or four. The way to know how many email courses to create is to take one step back and think about who is the ideal customer “avatar” for each product. In Javier's case, he has a product about photo editing and one about lighting in photography. For a moment, let's assume that both are 101-level courses, and the ideal customer is a relatively new “shutterbug,” a hobbyist photographer who is just learning the ropes. In this case, you can do just fine with a single email course as your main lead magnet. Pick whichever topic brings you more traffic—either lighting tricks or photo editing, create an email course around that to sell your first product, then as soon as they finish that, you can start sending them emails about the other product. Both products are likely to be relevant, because most amateur photographers have a similar level of skill and knowledge. Say Javier is still selling Lighting 101, but his photo editing course is aimed at professional photographers who are retouching studio portraits. This is where things can get more complicated. Here you probably *do* need multiple sales funnels, because you're talking to divergent audiences with different problems and different skill levels. Pro photogs may be insulted by the basic Lighting 101 content, and the Photo Editing 401 content will sail over the heads of the shutterbugs. One email course and sales funnel per customer avatar. Don't make it more complex than it needs to be.